Hoo boy! Summer is here, and how! There have been days this year when you probably felt like an egg being scrambled. And though we all spent the winter whining about how we missed the sunny days of summer, now that they're actually here, we find they make for hot and sultry nights – not ideal for sleeping. Not everyone can afford an air conditioner. And in cooler countries where proper summer lasts barely two months, installing one may seem like an extravagant and unnecessary expense. But then what does one do about those days (and nights) to keep their bed cool, when it's just too hot to go to sleep? 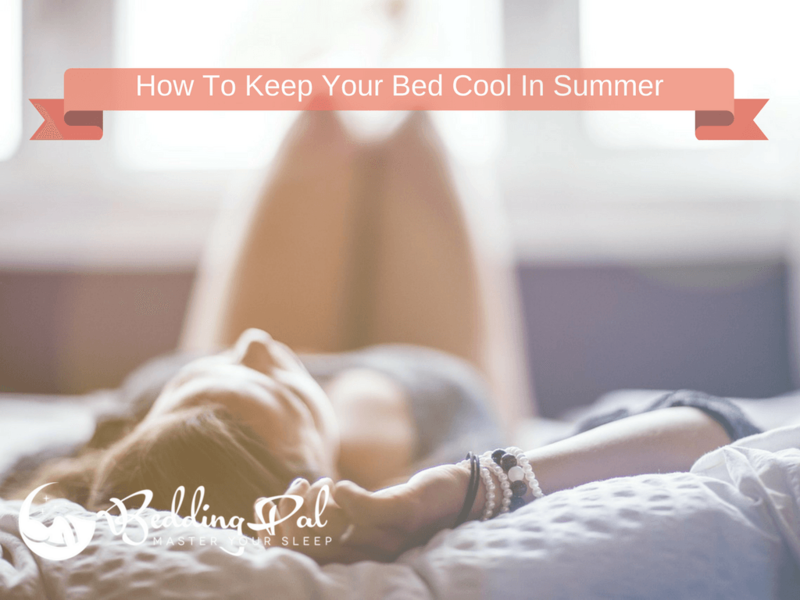 We've compiled here a list of 10 tips to keep cool in bed without AC, including advice from the website of the Sleep Council – the consumer education arm of the trade association for British bed manufacturers. Grab a cool drink and read on! This one is obvious – open the windows: Get Mother Nature to work for you - open windows to let the breeze in. Create cross-ventilation by opening windows and doors in multiple rooms so that the air can move right through the house and cool your warm bedroom. Choose summer-friendly bedding: The fabric of your bed clothes plays a significant role in air circulation – one of the key things that helps your bed to stay cool during the night. Cotton is the best choice as it breathes well and absorbs sweat. Get lightweight cotton sheets for your bed, and replace your thick duvets with more lightweight cotton sheets. For a jump start, check best cooling pillows. Keep cold water at hand: Staying hydrated by drinking plenty of water helps keep your body cool during the summer. But if you drink too much close to bedtime, you'll feel the urge to attend nature's call more than once in the middle of a comfy sleep. Instead, stop drinking water two hours before your bedtime, and keep a chilled jug or glass of water near your bed so you can have a sip if and when you wake up from feeling too hot. Use a “cold” water bottle: In winters (and when aches and pains attack), hot water bottles are your best friends. There's no reason they can't be your buddies in summer too. Just fill them with water, pop them into the freezer during the day, take them out and tuck them into your bed at night as a fresh ice pack. Freeze bedclothes: Go one step further by sealing your sheets and covers in plastic bags and popping those into the freezer too for a few minutes, so that you have lovely cold fabric to sleep on and under. Don't overdo it or you will feel like Frozen's Elsa in her ice castle, where even the sheets are probably made of ice. Use an electric fan: It is an affordable and versatile alternative to an air conditioner for your home. Usually available in hardware and home appliance stores, you can choose “column” models or pedestal models of electric fans. Simply plug them in near your bed, and feel the cool breeze. The best part of electric fans is that they are easily portable and you can move them from one room to another or just around the room according to your comfort. Hang a wet sheet by the window or next to the fan: It is an old school trick – soak a cotton cloth in water, wring it out (to avoid annoying little pools of water on your bedroom floor) and then hang it up in front of an open window or the aforementioned electric fan. The breeze will pick up cool moisture as it passes through the sheet so that by the time it reaches you it's a welcome relief from the heat. Wear cotton pajamas: Choose the right clothes for yourself too. Wear light and loose cotton shirts and shorts/PJs to allow for air circulation and absorption of sweat. Some people choose to wear nothing at all, but this can end with you feeling like a sweaty and sticky mess since there are no clothes to absorb your perspiration and to separate your body parts from one another. Take a cold shower before bed: Note the word “cool” here. Don't take a cold shower, or you'll take a long time to fall asleep after all that stimulation. Bathe in water that's slightly cooler than room temperature, and you can go to bed feeling fresh and cool. It also has a relaxing effect for many people, helping you to sleep better. Sleep alone or at a distance from your partner: Unfortunately, summer is not very cuddle-friendly. Sleeping in proximity with your partner can make you both sweaty and uncomfortable thanks to the body heat building up. One of you can either sleep on the guest bed (hopefully it'll only be for a few nights), or you can sleep well apart from each other on your double bed. It is where a spacious bed comes in useful. Have you nodded off from reading this article in the summer heat? Wake up, and put some of these tips into action. There's nothing worse than being too tired to stay awake but too warm to fall asleep – it makes for grumpy mornings and zombie-mode days. Keep your home cool with blinds and curtains, and don't forget to stay protected from the harsh sun when you go outside. Preferably, use sunscreen and sunglasses, and avoid overexerting yourself outdoors. Happy summer nights!